We are found all over Ireland- and the World. We are descended from several Norman, Anglo-Saxon and Viking ancestors who arrived in Ireland at different times in history. Our name first appears in Irish records in the 1100's as Ulf, a viking or Saxon name. A short time later, Woulfe ancestors named Le Lou appear. It's likely these Norman Le Lou's accompanied the invader Strongbow as knights or soldiers. They later appear to be in the employ of the Geraldine Earls of Limerick and Kildare. English Wolfes arrived later in Cork and Kildare. Our ancestors have played important roles throughout Irish history. In the centuries since, we have spread all over the planet. We are most numerous in the US, but we have many cousins in Australia, New Zealand, Africa, England, Canada, and Germany! 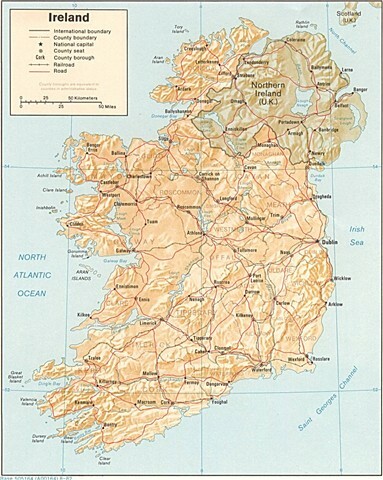 Where did our ancestors live in Ireland? Our earliest Woulfes are found in many places throughout the island. A large number of us in the U.S. are descended from Woulfes in County Limerick . But, records show Ulfs and Le Lou's in Dublin, Wexford, Clare, Kilkenny, Louth, Down, Tipperary, and Waterford. 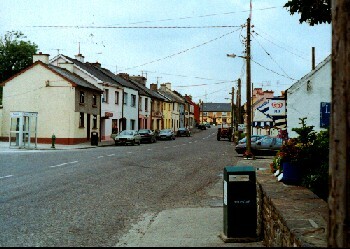 Quite a few Woulfes came from right around this little village in Limerick pictured below. It's a delightful place called Athea. That yellow building on the left corner used to belong to a Woulfe family. Athea has a special place in my research, because two of my major contributors, Sean deBhulbh and John Woulfe are descended from Athea Woulfes. Ours is a fascinating history, with twists and turns and many unanswered questions...and some legends. The majority of the hard historical work in this project was done by professional Geneaologist Paul MacCotter in County Cork. The family trees in this project are from many Woulfes and Woulfe relations, some of whom worked on them for decades. There will be many unanswered questions, because some family histories were lost, others are incomplete, and others relied on unverified information. But, all versions are included. Below is the index of pages. If you know the County or town your Woulfe ancestors came from, it's a huge head start. There are also pages dedicated to the history of the family name, a family tree, and a few useful maps. Welcome ... It's the place where you'll find the latest Woulfe news. 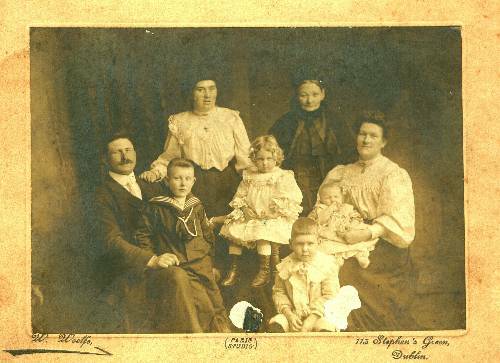 The Woulfe family in Ireland ... Genealogist Paul MacCotter's research into our origins. The Original Woulfes of Limerick ... Limerick is the "mother" county for most of us. Ardagh Limerick Woulfes ... These are my ancestors. Athea Limerick Woulfes ... Athea is the origin for most of the Woulfes in the U.S.
Clare Woulfes ... Background on Woulfes from the western county. Cork Woulfes ... and Wolfes. Here's where you learn the difference. Crioch Woulfes ... A townland near Athea. It's the origin of the ancestors of John P. Woulfe in Australia. I consider John my mentor in this project. It was his help right from the beginning in 1997 that spurred the growth of this project. I finally got to meet my good cousin in Australia in 2000. John is really into history. He founded a re-enactment society in Mansfield, Victoria. 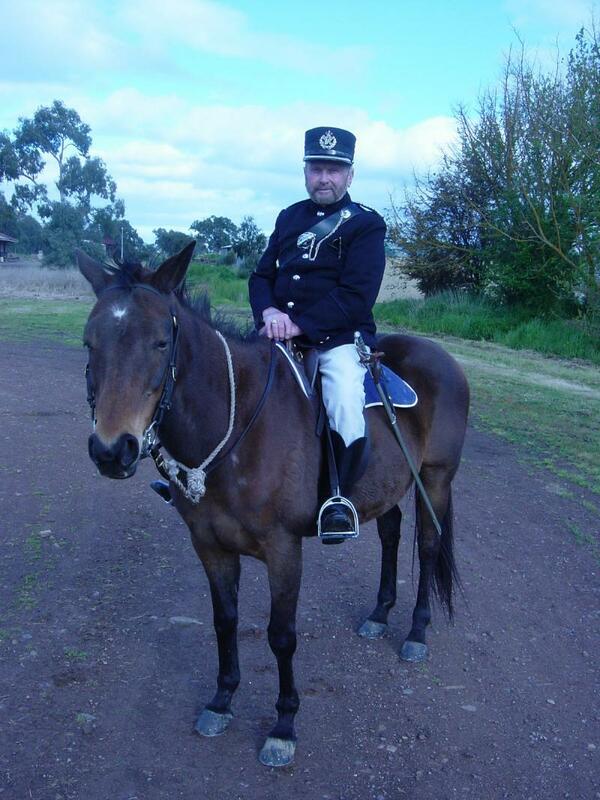 Here's John at a 2004 ceremony honoring the history of the Victoria police and their gun battle with Ned Kelly. John and his mates also starred in a highly acclaimed Australian film version of the Ned Kelly Story. Dublin Woulfes ... Here's where we get into some serious Woulfe history. Kildare/Wexford Woulfes ... Another place where we find the earliest Woulfes - and a later arrival. The Woulfes of Kilkenny, Louth, Down, Tipperary and Waterford ...I grouped these together in one section because of the small numbers of Woulfes in these counties and limited information available. 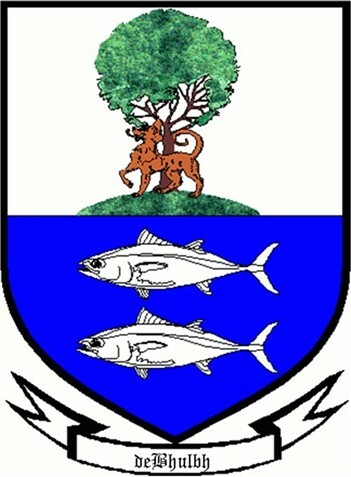 Knocknagorna Woulfes ... another townland specific Group of Woulfes. These are Peter Woulfe of Australia's. Templeglantine Woulfes... Richard Woulfe's Meenoline ancestors. He provided me with information going back to the 1840's. He has a GREAT family history. A real success story. General James Woulfe ... Is he one of us? Take a look at the different points of view. Hugh Lupus ... Lupus - Latin for Woulfe. Was he one of our Norman ancestors? Theobold Woulfe Tone ... Another Wolfe/Woulfe whose family origins disputed. Rathkeale Woulfes ... Research on Woulfes who settled in Rathkeale from Mossie Woulfe. Under construction.